The Thoroughbred Corporation’s War Emblem got one step closer to the Triple Crown as he captured the 127th running of the Preakness Stakes-G1 by three-quarters of a length over fast-closing Maryland-bred Magic Weisner. The Bob Baffert trainee proved that he was a “bona fide” winner of the Kentucky Derby-G1, which he won by wiring 17 rivals in a $43 upset. Magic Weisner–bred, owned and trained by longtime Maryland horsewoman Nancy Alberts and named for local veterinarian Dr. Allen Wisner of Glen Rock, Pa.–came close on Maryland racing’s biggest stage at 46-1 under Richard Migliore. “. . . I thought he was going to be third, then second, then I thought. . . but I knew the winner wasn’t stopping,” said Alberts. For the second year in a row, Preakness day set a record for mutuel handle, with more than $71.4 million bet all sources (including in-state, out-of-state and separate pools). The attendance of 101,138 was the second largest in Preakness history. War Emblem’s Triple Crown hopes were dashed after stumbling at the start of the Belmont Stakes-G1 and finishing eighth. • The top two Preakness finishers were by stallions who stood in Maryland that spring. It was like hitting the lottery for Audrey and Allen Murray, who purchased former Claiborne Farm stallion Our Emblem the previous fall, then watched as the son of Mr. Prospector became the hottest sire in the nation with the exploits of his sons War Emblem and Arkansas Derby-G2 winner and Kentucky Derby starter Private Emblem. The Murrays had syndicated Our Emblem for $7,500 a share (selling 18 of the 40 offered) and at the start of the breeding season, stood the 11-year-old stallion at their Murmur Farm in Darlington for $4,000, with a book of approximately 40 mares. By May, Our Emblem’s book had grown to 95 mares and his fee was $7,500. Then the Murrays received the offer they couldn’t refuse. Our Emblem was sold on June 5 to WinStar Farms and Taylor Made Farm for a reported $10.1 million?–?more than 20 times what the Murrays paid. He would cover his final mare in Maryland on June 30 and ship to Kentucky. Magic Weisner’s sire, Ameri Valay, was well-known in Maryland. A state-bred champion by Maryland sire Carnivalay, he stood at Shamrock Farms in Woodbine. Magic Weisner was one of 73 foals in Ameri Valay’s first four crops to race. 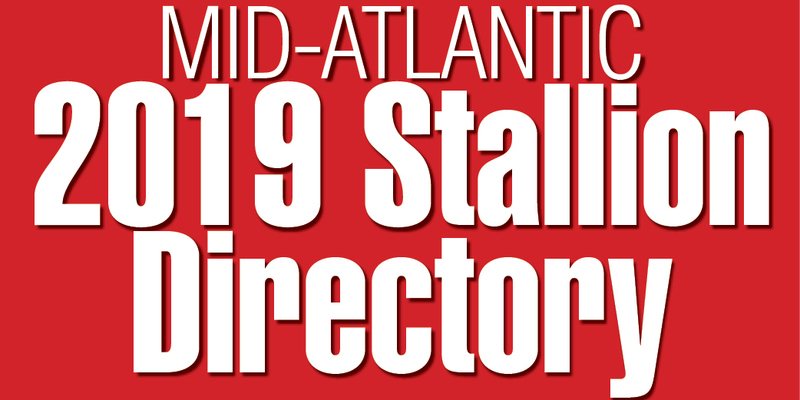 • The strength of the sales market was evident when the Fasig-Tipton Midlantic 2-Year-Olds in Training sale saw gains in gross (total $9.3 million, up 9 percent), average ($33,023, up 4 percent) and median ($22,500, up 7 percent). A May sale record 15 juveniles brought six figures, many pinhooking coups. 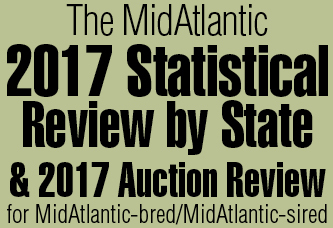 Counted among those was the $280,000 sales-topper, a Maryland-bred colt by End Sweep out of the Phone Trick mare Line’s Busy. Consigned by Florida-based Valley View Farm (Walter Burke), he was sold as a yearling at Keeneland the previous September by his breeders, Sondra and Howard Bender, for $53,000. • Freshman sire Partner’s Hero, who stood at Northview Stallion Station in Chesapeake City, Md., got his first winner when Jay Em Ess Stable’s Joanie’s Smile easily won a 5-fur­long maiden special weight at Belmont Park May 8. A graded stakes-winning son of Danzig and half-brother to champion sprinter Safely Kept, Partner’s Hero was also a hit at the Fasig-Tipton Midlantic 2-year-old sale. Among his five offspring sold was a Maryland-bred colt out of Nin Two (by John Alden)purchased by Buzz Chace for $135,000. That 2-year-old, consigned by Hoppel’s Horse and Cattle Co., was the most impressive pinhook of the sale, having sold previously at the Keeneland September Yearling sale for $6,000. Nin Two’s colt was well worth the price. Named New York Hero, he earned $628,438, and was named Maryland-bred champion 3-year-old male after capturing that season’s Lane’s End Stakes-G2. Dark Hollow Farm and William Beatson? bred the colt; Dark Hollow’s David and JoAnn Hay­den also bred Partner’s Hero (with Gilman Investment Co.).